With WooCommmerce Restrictions, you can protect Posts, Pages, Tags, Categories, Role-Based Capabilities, Custom Capabilities, and/or specific URIs matching a list of patterns you configure. You can then sell access using simple Products, variable Products, or grouped Products. If you're running WooCommerce Subscriptions, you can also sell access to Restrictions using simple or variable Subscriptions. A Restriction allows you to protect content in WordPress. You can create as many Restrictions as you like, but a single Restriction is capable of protecting multiple Posts, Pages, URI patterns, and more — depending on your configuration. 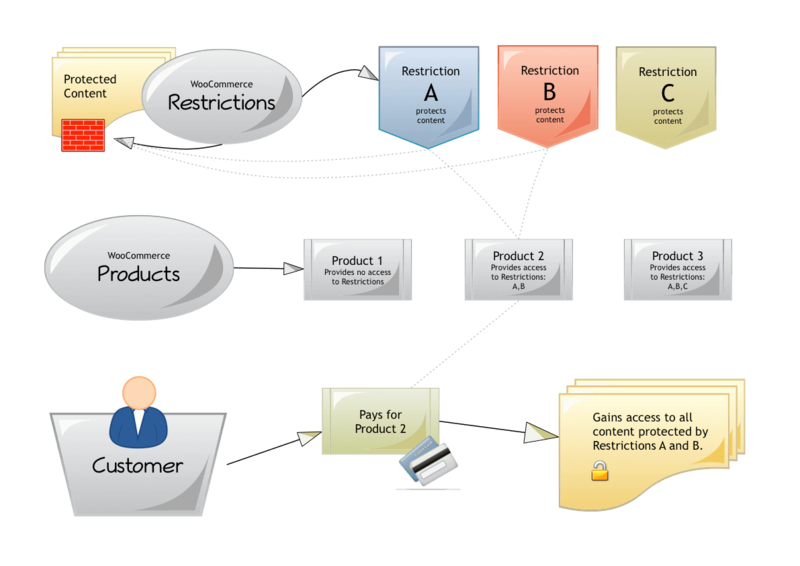 At the same time, a Restriction also defines a set of permissions, because you can sell (via WooCommerce Products), or otherwise allow, access to what a Restriction protects. So you can think of Restrictions as both a form of protection and also as a way to prepare packages that can be accessed by others. In short, anything that a Restriction protects will be off-limits to the public, and any Customer that gains access to a Restriction will unlock everything that Restriction protects.